Alfred calls Batman and Robin back to Wayne Manor after he finds a safe has been robbed. A mysterious amulet is missing. A quick review of the security footage shows it was Alfred himself who admitted the thief, and then escorted him out again, though Alfred has no memory of these events. Bruce recognizes Stinky Malone as the thief, and sets out to question him. Stinky doesn’t remember much, but it’s enough to make Batman suspect the Hypnotist is the man pulling the strings. He recalls his first encounter with the Hypnotist while Bruce was studying under Zatara. The hypnotist was after amulets in Zatara’s possession. The Dynamic Duo learn enough from Stinky to know where the Hypnotist is located. When they arrive, the Hypnotist sets his hypnotized minions on the Caped Crusaders. When that effort fails, he simply uses his voice, and the perceived power of the amulet he stole from Wayne Manor, and subdues Batman and Robin while the Hypnotist escapes. Batman recalls another past incident, when the Hypnotist stole the amulet from Zatara. He threatened Zatana, and then used his powers to subdue her and Bruce while he escaped. When Zatara arrived, he promised to teach Bruce how to resist the Hypnotist’s powers. When Bruce and Robin awake, Robin has no memory of what just happened. Batman takes Robin home, and then heads out to find Zatana. He finds her performing on stage. At intermission, as Batman, he delivers his warning. But she insists the show must go on. During the second act, the Hypnotist strikes, and manages to kidnap the magician. Batman fends off the hypnotized horde, and escapes through a sewer. 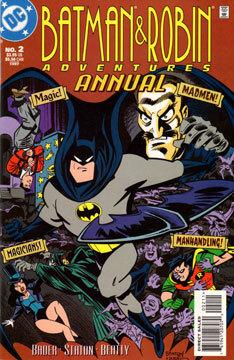 Robin picks him up in the Batmobile, and Batman tells Robin more about the Hypnotist’s past. After Zatara taught Bruce how to control his mind, Bruce stopped the Hypnotist from robbing a store full of people. When the Hypnotist saw he had no power over Bruce, his belief in his powers crumbled, and he was helpless. Back in the present, the Batcomputer indicates it has the location of the Hypnotist. He’s hiding in a warehouse, with Zatana as his captive. He explains to her he could control her, but there are some things he would prefer she do willingly. He tells here of the second amulet, and how his powers will increase when he has both amulets in his possession. Batman appears, and the Hypnotists attempts to control him. At first, it seems Batman is under the Hypnotists sway, but in reality he’s just play-acting to get close enough to deliver a body throw. Batman grabs the amulet, and then throws it to Zatara, who makes it “disappear.” The Hypnotist believes the amulet is gone, and with it his belief in his powers. He is now helpless. A fine tale! This story builds nicely on Batman’s past with Zatara and Zatana, and manages to add a decent C-List villain to the ranks. I very much enjoyed this, and would argue this is a contender for things-that-ought-to-have-been-animated. Pretty good! The characters are on model, and the style of the show carries though. The look of the Hypnotist made me chuckle, though. He reminds me of a Rankin-Bass style character.